If you are looking for a natural sunscreen that is suitable for sensitive skin, Lavera Sun Cream with SPF30 could be a perfect fit for you. First of all, Lavera’s sunscreen is really natural, it does not contain any synthetic preservatives, perfumes, colourants and mineral oil products. It contains 100% pure vegetable oils, active plant agents and essences; it also contains mild emulsifiers and surfactants. In the ingredients’ list, you will find organic moisturising ingredients such as sunflower oil and shea butter – these are there to help you keep your skin soft and supple. The soothing calendula, on the other hand, is there to help you heal irritated skin affected by rashes, eczema, inflammations and acne. The sun cream contains beeswax so it’s not suitable for vegans. Although Lavera’s sunscreen is free from artificial fragrance it does contain fragrance but it’s in a natural form (from pure essential oils). The sun cream also contains alcohol which I think it could have a drying effect on the skin. EDIT 16.07.18: After using it abroad for a few weeks I can now confidently say that this sun cream definitely drys the skin out so I recommend you always apply body lotion or oil after showering on the day you used this sunscreen. Like this you should be able to prevent and minimise any dryness. Raw shea butter is great for this. Lavera’s SPF30 sun cream will protect you from both UVA and UVB sun rays. Lavera follows the recommend EU guidelines for UVA protection: sun rays are blocked in a ratio UVA to UVB of 1:3 as recommended by the European Commission. 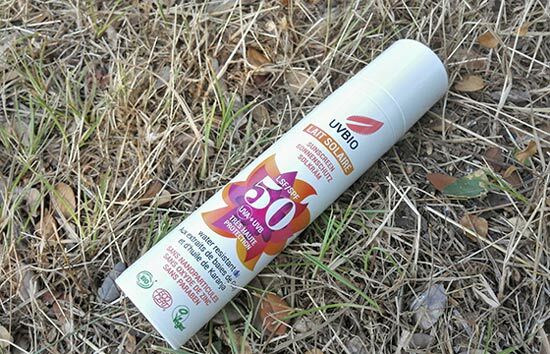 This means that for every 3 UVB rays the sun cream protects you from, it will also protect you against 1 UVA ray. 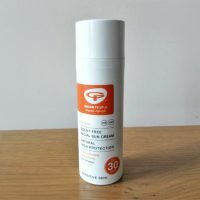 From my experience, the level of sun protection is great – I’ve never burnt using this sun cream even in a really hot sun. If you are a new LoveLula customer you can save 15% on Lavera products, (you also get a free gift), just click here and wait for the pop up to appear). Lavera Sunscreen SPF30 is certified by NaTrue which means that the product is natural and meets high natural and organic cosmetics standards. The sunscreen comes out of the tub easily (not like Odylique’s sunscreen!) and has a lovely natural scent. It spreads easily and after massaging it into the skin well, any whiteness almost totally disappears. For my light complexion this is fine and I have no problem with that but I think this sunscreen would be better suited for those with more pale complexion and may not be suitable for those with darker complexion. If you are darker, it’s possible that you will be left with some quite visible whiteness on your skin which will make you look unnatural. Lavera’s sunscreen protects my skin really well and stays on for a long time. I haven’t been burned wearing it. It’s great for outdoor sports as well as it doesn’t block your pores and doesn’t make you sweat more. I like that it comes in a small 75ml tub which I can take with me on holiday. In terms of cost, it’s pretty affordable, at £12.95 it won’t break the bank. And remember, you can get 15% off discount here if you are new LoveLula customer. I haven’t tried it on my face yet as I’ve been using Madara Sunscreen SPF30 for that but it can be used as a facial sunscreen if you like. Just bear in mind that it may leave some whiteness (it really depends on your complexion – if your complexion is quite light, this should be fine). 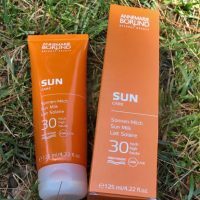 Overall, not a bad sunscreen and I am happy to recommend it to those with sensitive skin and lighter complexion. Just one negative which bothered me a little bit was when I applied it all over my body, it was not easy to remove it in the shower – there was some whiteness left even after washing my whole body with a soap. Not a major problem (as it will wash off at the end) but it’s just something to be aware of. Have you tried this natural sunscreen from Lavera yet and what did you think? I’ve tried a lot of Lavera products but not the sunscreen. I love the price of this one and the calendula ingredient. The Green People sun lotions contain it, too. Thanks for the detailed review! Glad you enjoyed the review Helen. I think in general Lavera products are quite affordable and I wouldn’t hesitate buying them when abroad (they are available in big shops in Slovenia, for example).